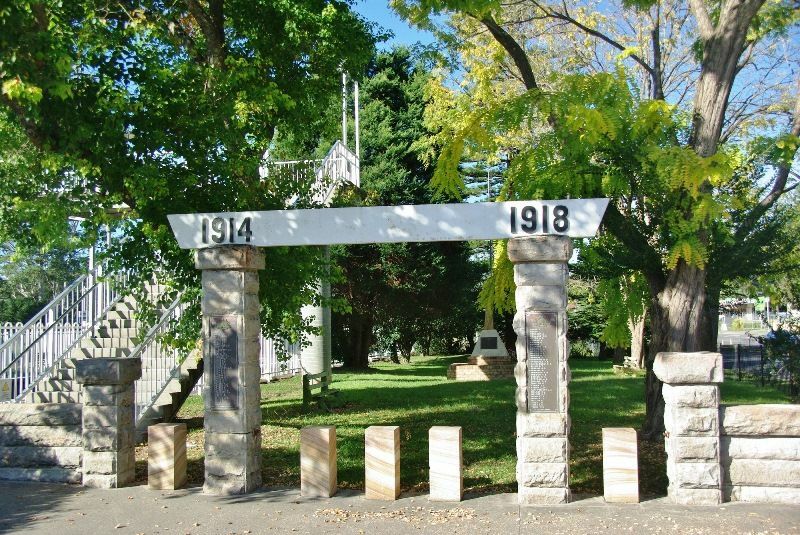 The Ourimbah Memorial Arch commemorates those who served in World War One. The Ourimbah War Memorial was unveiled yesterday afternoon by the State President of the Returned Soldiers' League (Mr. L. A. Robb). Many returned men and other citizens from the surrounding districts attended. Addresses were delivered by Mr. Robb, Mr. S. L. Gardner, M.H.R., Mr. R. B. Walker. M.L.A., the President of the Erina Shire Council (Cr. A. E. Lillicrap) and the President of the Returned Soldiers' sub-branch (Mr. J. Lann). Mr. Robb was surprised that the memorial had a deficit of £15, and asked if there was not as much money in the country now as in 1914. 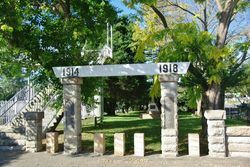 The memorial consists of gates to a small park and on the pillars are plaques bearing the names of men who enlisted from the district. The enclosure adjoins the railway station, and is intended as a rest refuge, between railway and highway, for young children and aged people. Newcastle Morning Herald and Miners' Advocate (NSW), 2 May 1938.